Enjoy a walk on the MILLENNIUM WAY. The beginning or end of the MILLENNIUM WAY either way this is a delightful walk with open country and gentle undulation. The way is clearly waymarked with the distinctive black Millennium Way circular waymarkers. Find out more about the walk by clicking on the information icon. 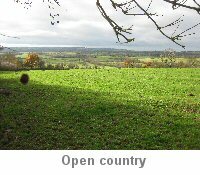 This delightful circular walk starts from the ancient church of All Saints dating back to AD130. Of particular interest are the ceiling paintings by William Morris. There is also interesting history on the church web site. 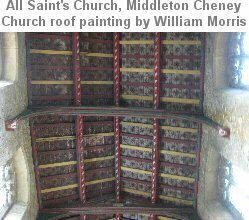 Middleton Cheney is some 2 miles east of junction 11 on the M40. 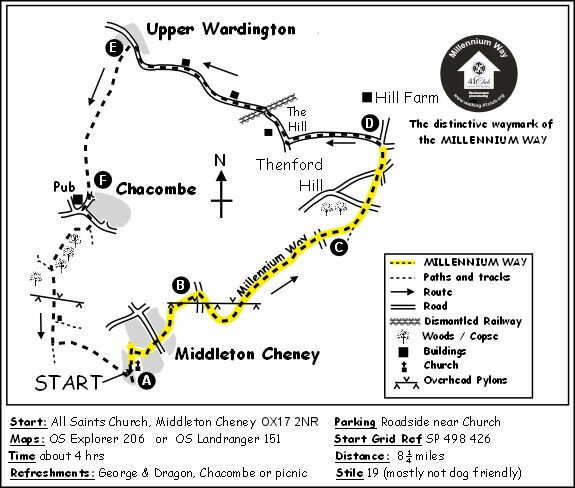 During the first half of the walk you enjoy a delightful section of the Millennium Way - the route being clearly marked by the distinctive black waymarkers. Facing the front of All Saints Church the route takes the lane to the left of the church (Church Lane). Go past Rectory Lane and continue down to reach the T-junction (opposite a house - No: 24 - named Stoneleigh) turn right here into Glovers Lane. At the end of the lane the pathway crosses the main road and takes the unmade vehicle track to the right of the footpath sign passing between the gardens of domestic properties and then along a narrow passage at rear of houses, with tall wooden fence left. After approx 300yds the track becomes a footpath and ends at a gap into large field. Go left to follow Millennium Way waymarker with hedge left, following path around field edge under power lines to find stile. Take stile and go ahead with hedge left to exit by stile to road. Cross road to drive and after 10 paces take stile right signposted "Footpath to Thenford" Follow field edge with fence and stream left, eventually crossing stiles / footbridge and continue ahead with hedge left to cross stile, to reach a further stile in field corner by a damaged brick wall. Take this stile then cross stone bridge and go right with fence right to gateway. Take gateway and go diagonally ½ left across field under power lines aiming for field corner by trees. On reaching trees go right following Millennium Way waymarker on hedge post with hedge left to gap, then leaving trees behind you continue on same line diagonally across field down towards trees to pass through hedge gap. Cross field corner to take small timber bridge, over a stream and turn left with hedge left to stile. Take stile and go diagonally ½ right across field to road, aiming for green footpath sign. Cross road and stream and go ahead diagonally right climbing gently up field passing under mid field power lines to top corner gap to join a farm track. At the top be sure to look back at the glorious 180° view with the majestic spire of All Saints Church in the middle distance. Follow track left to pass bungalow right along farm driveway to the road. Cross road and take stile into field, continuing with hedge right to exit by far right field gap. Go directly ahead over next field eventually to pass under power lines at corner of field to cross far right corner stile giving access to farm drive. Go left on drive for a few paces to reach road. Cross road and take track marked bridleway continuing along with hedge left, under power lines, to reach a lane at the crossroads. Here we leave the Millennium Way and turn left along the lane signposted Upper Wardington. Continue along lane to reach the T-junction with glorious views ahead. Turn right following the lane down to cross the bridge which crosses the dismantled railway line and ahead to eventually reach the outskirts of Upper Wardington. Pass 30mph restriction signs at entry to the village and then take footpath left signposted Chacombe through the metal kissing gate. (here we share the route with the Jurassic Way - which is well waymarked back to Middleton Cheney) Go diagonally across field towards far corner then take gate, and go ahead with hedge right to take next corner stile. Continue directly ahead through several fields and over stiles, following the Jurassic Way, keeping the village of Chacombe ahead and to the left, eventually to pass through tunnel under dismantled railway, emerging on to a farm track. Go straight across following waymarker keeping fence right. Cross wooden bridge over stream then a second bridge rising slightly uphill, passing a row of houses left to enter the charming village of Chacombe. When you reach the road turn right signposted the Jurassic Way and continue on down to pass the George & Dragon village pub (17th Century). Take first road left, signposted Middleton Cheney then almost immediately take the gravelled drive on your right past houses and through the metal kissing gate into a small copse. Just before you reach another metal kissing gate take footpath right through wooded area taking kissing gate to follow Jurassic Way marker up field to corner kissing gate. Take kissing gate and stay ahead with wire fence left. On reaching field corner take stile into narrow passage exiting via wooden kissing gate to field. Stay ahead up field towards the narrow pylon to reach a gate. Take gate to proceed along attractive woodland path. Exit by wide metal gate and continue up track at field edge keeping hedge right. About halfway down this large field edge you will find a hidden way post in the hedge on right. At this point you must turn left to cross the field heading slightly left of the spire of Middleton Cheney church to find and enter a hedge gap at edge of field. Cross track and continue across next field heading directly for the church. Go through gap and cross road to continue through gap opposite and stay with wire fence right heading towards church. Halfway down the field take care not to miss gap on right. Take gap and over stile to then continue with hedge left. The path gradually descends to a gated wooden bridge. Take bridge to go uphill towards church and then take stile adjacent to stone wall. Stay ahead through narrow passage, then down access track to road. Turn left to arrive back at the Middleton Cheney church. Middleton Cheney is one of the largest villages in South Northamptonshire and is located on the ancient trackway between Banbury and Northampton. All Saints church was built in 1302, of note are the ceiling panels painted in 1865 by William Morris and the Pre-Raphaelite stained glass windows by Edward Burne-Jones in 1870. 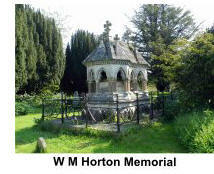 In the churchyard is the ornate memorial of W M Horton and his family, benefactors of the hospital in nearby Banbury. 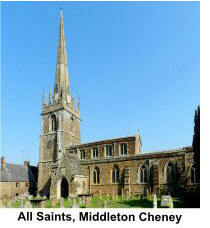 Also buried here are forty six roundheads of the Civil War killed in a skirmish near Middleton Cheney on 6th May 1642. Two hundred and seventeen rebels were also killed. Chenderit School is a mixed 11–18 county comprehensive school. The name 'Chenderit' is an adaptation of the medieval Lord of the manor Simon de Chenduit in the 12th C. It has an Art Gallery called the Michael Heseltine Gallery. After Fernhill farm entrance, cross the abandoned railway, a branch line of the Great Central Railway running nearly nine miles from Banbury to Culworth Junction. It was closed in April 1965. In 1469, during the War of the Roses, the Battle of Edgcote Moor was fought near Wardington. Hugh de Chacombe, lord of the manor of Chacombe, founded Chacombe Priory in the reign of Henry II (1154–89). In 1536 the priory was suppressed in the Dissolution of the Monasteries. Today the only visible remains are a small chapel apparently built in the 13th century and a set of mediaeval fishponds. 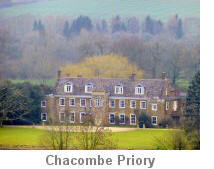 Part of the priory site is now occupied by a house, also called Chacombe Priory. The house has a large Elizabethan porch. From 1605 until 1785 the Bagley family of Chacombe were bellfounders, casting more than 440 bells for churches in England, including the four 1694 bells in Chacombe parish church. 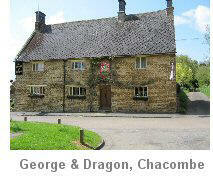 The George and Dragon, a 17th century building with original beams, fireplaces and a well offers a very welcome break.